A completely unrelated photo that has nothing to do with what follows. Our family celebrating Sabbath as we usually do by hanging out with my dad and stepmom at the cottage this morning. Left to right: My dad and step-mom cleaning up after breakfast. 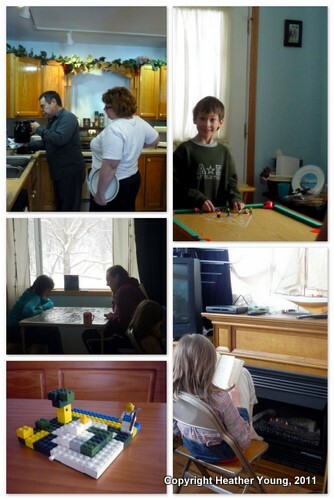 Issac making up games using Lego-men with my brother who got cut out of the picture, Rachel and Shamus doing a puzzle, Essie reading in front of the fireplace, and Rachel's Lego version of Minecraft. God has been doing so much this weekend, and not all of it is finished, that I want to wait and post about it tomorrow. However I thought I would share several other things today. The problem is that when you get out of God’s will you don’t hear so well. If there is sin in your life that God wants to deal sometimes He will directly intervene (remind me to tell you sometime about how, back when my husband and I were still dating his car got stolen and torched AND he lost his job within a few weeks time.) Of course that does not mean that every time things go wrong He is dealing with some sin but sometimes He is. Other times He will allow you to move out of hearing range. The sin builds a sort of barrier between you and Him until you deal with it. He is still there, you just don’t hear so well and so you are constantly floundering, struggling, and feeling uncomfortable. That is how I spent most of my teen and college years and I very seldom feel that feeling now, which is nice because it makes it easier to recognize when it hits now. So we made mistake after mistake last weekend, mostly because of an attitude problem that we thought was a small thing and which turned out to be rather deeply rooted. By Sunday evening we had identified the problem, apologized to God, and figured out what we needed to do to make things right, but we still had to spend the rest of the week cleaning up after the mistakes made while we were out of God’s range (metaphor–we are never really out of God’s range, His voice is calm and quiet and sin is just so loud and chaotic.) Mostly it meant trying to figure out where money was and needed to be in order to pay what needed paid when and an awful lot of running about and spinning our wheels. Really, you would not believe the number times we ran into dead ends. For instance we were trying to transfer money from one account to another using 2 debit cards. No big deal. Easy. Except that the atm that always just works for both cards was closed for maintenance, the one next door wanted to charge $3 for the transaction, the other card that should have worked just wouldn’t, and so on. I finally realized that I was just NOT going to be able to transfer that money and gave up. Apparently that was not how God wanted me to handle that particular bit of money that day. This was our whole week, still trying to get back where God wanted us, to hear again. Isn’t that beautiful? And it is exactly what we as a family need. We have been floundering financially since the week my mom died which was incidentally the same week Shamus was cut back to part time at his old job and the same week that we had just used our backup funds to purchase a new-to-us vehicle, and then even worse since they cut his job completely and we haven’t received the check from the other company he deals with, and which we had been living on. For the last few months we have been living completely on what He provides. We ha veknown He must be doing something as He kept herding us in this direction and taking care of us while He did but there is now something more to it. Somehow we just know that we are on our way, that we have gotten out of the holding pattern and He is going to make something of where we are or where we are going and do something new. He is consistently blessing our creative endeavors and continues to encourage us to use the gifts and passions He has given us without a backup plan which definitely goes against the way the world does things. We don’t know what He is up to but He is obviously at work doing something, we don’t know what His time frame is but we know it is there. So that is exciting and an adventure, and we are the sort of hobbits who like adventure– definitely of the Took line. I also want to share with you another post this week over at Seth Barnes’ site, which perfectly encapsulates our experience over the last 2 years. These two years have not been comfortable but God wanted us to change and grow and chose this time to change us, a lot. Seth writes about how God uses discomfort for our benefit. I saw the post this morning and shared it with Shamus, who nodded his way through the entire article. God has used discomfort in all 5 ways in our lives over these last few years and I am sure He has probably done used it for you as well. t is one of the simplest ways to prod we lovers of comfort into action. Hop over to Seth Barnes’ site to read about the 5 Benefits of Discomfort.